PETER MAASS|AIWA! NO!|DEADLINE|THE OPPOSITION to Brett Kavanaugh that has gotten the most attention is, naturally, the Senate Democrats who are voting against his Supreme Court nomination, and members of the #MeToo movement who believe Christine Blasey Ford and Deborah Ramirez when they say Kavanaugh drunkenly assaulted them in high school and college. But that’s just the tip of the iceberg. Across the country, a diverse array of prominent individuals and organizations have come out against Kavanaugh, quite publicly and quite surprisingly. That even includes friends of his. Unlike the political divide on Capitol Hill, which is predictably stark with the exception of a few wavering senators, the national opposition to Kavanaugh’s elevation to the Supreme Court includes a startling number of church groups, including Mormons and Christians. Conservative scholars and legal figures — such as former Supreme Court Justice John Paul Stevens, a lifelong Republican appointed to the court by a Republican president, Gerald Ford — have also spoken out against the nominee. “I think that his performance during the hearings caused me to change my mind,” Stevens said on Thursday. While Kavanaugh’s nomination had initially moved forward with broad support from religious organizations, that’s changed as a result of the sexual assault allegations, as well as the widespread impression that he lied during his testimony about having received stolen Democratic emails while working in the Bush White House, and that he mis-represented his drinking habits and the meanings of what appeared to be problematic remarks he made in his 1983 senior yearbook. Shortly after Kavanaugh’s testimony last week, a major Catholic magazine issued a surprising call for his nomination to be withdrawn. After initially expressing strong support for him, three of Kavanaugh’s former law clerks unexpectedly moved toward opposition to his nomination after the allegations of sexual assault emerged. 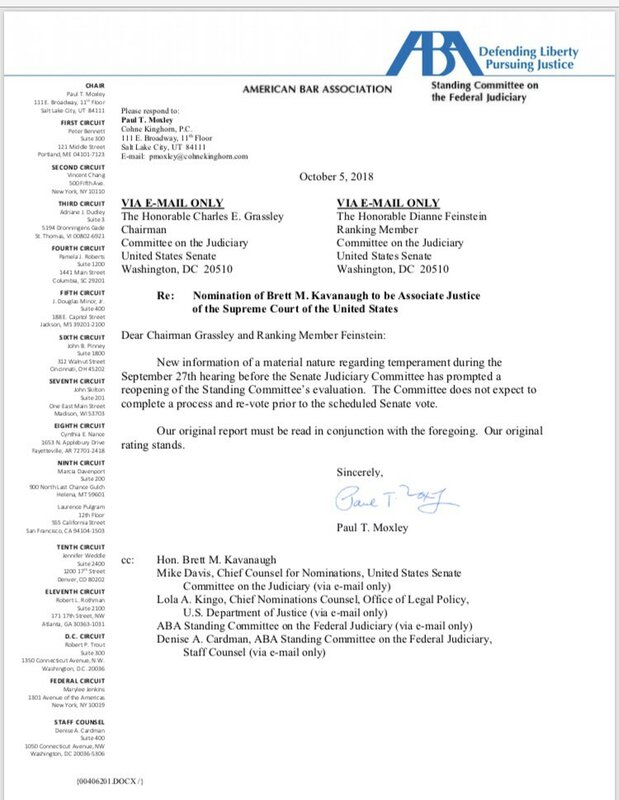 In a Monday letter to the Senate Judiciary Committee, the three clerks wrote that “we have been deeply troubled by those allegations and the events surrounding them and were encouraged by the initiation of a formal FBI investigation.” They submitted their letter before the FBI completed its investigation on Thursday. Though Republican senators applauded the FBI’s efforts, Democratic senators who read the investigation sharply criticized it because a large number of people who wanted to talk to the FBI, including Ford and Ramirez, were not contacted. Kavanaugh’s nomination initially received widespread support from his former high school classmates at Georgetown Preparatory School, and from former classmates at Yale University, where he was an undergraduate as well as a law student. But in the wake of the assault allegations and his testimony, that support began to crumble, too. More than 125 alumni of Georgetown Prep have signed a petition of support for Ford, calling on other alumni to come forward with information about sexual assaults Kavanaugh was involved in. “Our silence serves no one,” the petition states. More broadly, several thousand law professors across the country signeda letter against his nomination, stating about his testimony, “Judge Brett Kavanaugh displayed a lack of judicial temperament that would be disqualifying for any court, and certainly for elevation to the highest court of this land.” And just today, the American Bar Association notifiedthe Senate that it was re-opening its evaluation of Kavanaugh’s fitness to serve as a result, again, of his testimony last week. What follows is a list of people and organizations that have opposed Brett Kavanaugh’s elevation to the Supreme Court of the United States. Top photo: Protesters against Supreme Court nominee Brett Kavanaugh demonstrate outside the Supreme Court in Washington, Thursday, Oct. 4, 2018.